Drama in the makeup world! It's no secret that makeup artist Jeffree Star was called out in the past for his racist behavior. Recently, Kim Kardashian West told fans to "forgive" the makeup star after her fans dragged him for making fun of the way KKW displays swatches for her new powder contour palette. The whole drama started on Monday. The reality star debuted on social media her new powder contour palettes. With various Snapchat and Instagram stories, Kim shows off each palette's colors by using her arm and two other people's. After these tweets, KKW fans began to drag Star and bringing up his past regarding video's leaked of his racist rants. 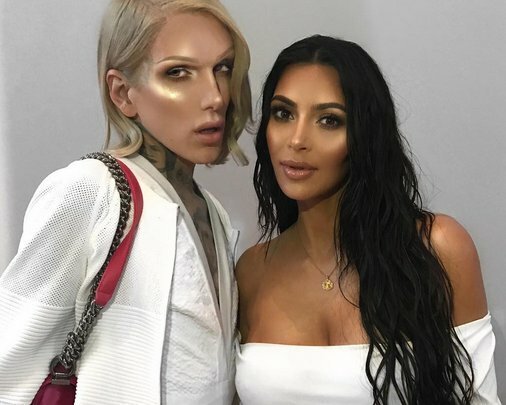 It didn't take long for Kim to jump on Snapchat to defend Jeffree. She acknowleged that she's new to the makeup swatch game and even her makeup artist, Mario Dedivanovic to help her.